Two units of barometric pressure are millimeters of mercury (mm Hg) and inches of mercury (in Hg). As the pressure increases, the mercury rises higher in the barometer tube. The height of the mercury can be measured in either inches or millimeters. 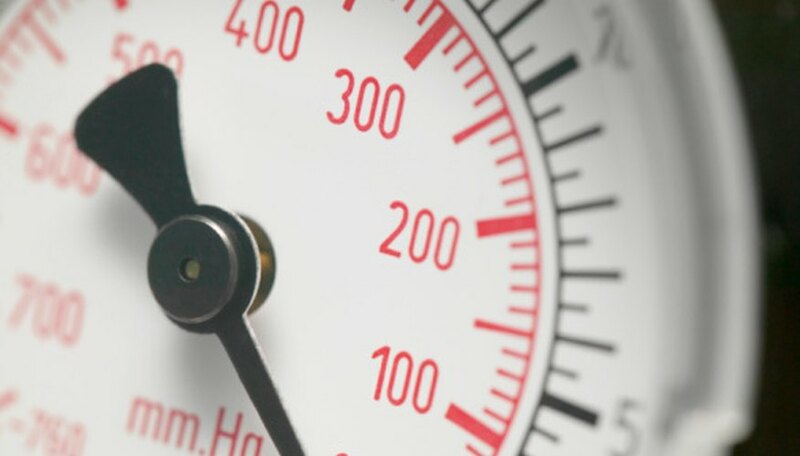 You may need to convert if you have a pressure requirement in mm Hg but your pressure-measuring device only measures in Hg. Multiply the pressure in mm Hg by 0.03937 to convert to in Hg. For example, if you have 29 mm Hg, multiply 29 by 0.03937 to get 1.14 in Hg. Divide the pressure of mm Hg by 25.4 to convert to in Hg. In this example, divide 29 by 25.4 to get 1.14 in Hg. Check your answer with an online mm Hg-to-in Hg converter. Enter the pressure in mm Hg and convert. Kennan, Mark. "How to Convert mm Hg to in Hg." Sciencing, https://sciencing.com/convert-mm-hg-hg-8425272.html. 24 April 2017.